The Through Night and Day actress shares the reason why she decided to shave her hair. 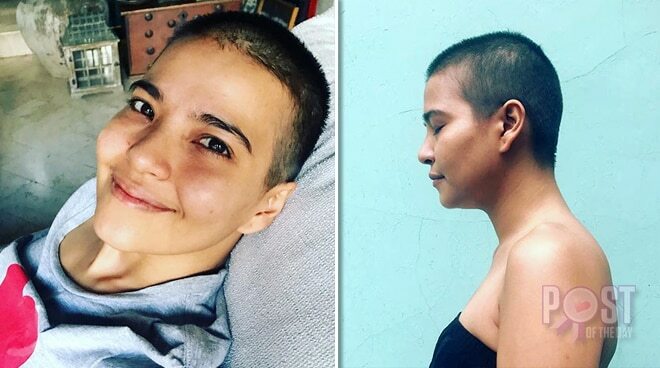 After days of speculation, Alessandra de Rossi took to Instagram to confirm that she went bald for the latest movie that she starred in, which was Through Night and Day. She shared her ‘very first photo without hair’ during her shooting days for the film. “Yes, I did it for the movie. Nanghihinayang kasi ako sa experience ng lahat kung hindi realistic,” Alessandra wrote. “Anyway… 1 cinema nalang natira. Paano yan? Pano ba to?! Leading man na muna ako for a long time. Salamat sa mga nanood! Moving on… Wala pa rin akong hair,” she joked. Day 1! My very 1st photo without hair sa shoot ng #throughnightandday! 😍😍😍 Yes, I did it for the movie. Nanghihinayang kasi ako sa experience ng lahat kung hindi realistic. Anyway...... 1 cinema nalang natira. 😂😂😂😂😂 Paano yan? Pano ba to?! Leading man na muna ako for a long time. Haahahaahaahahaa!!!! Salamat sa mga nanood! 🙏🏻🙏🏻🙏🏻🙏🏻🙏🏻 moving on..... Wala pa rin akong hair. TOINKS! Through Night and Day also stars Paolo Contis.